I have experienced JLR Bheemeshwari, K Gudi, Kali Adventure Camp, Kabini, Badhravati campuses. Recently I was invited by owners of thekarnatakatourism.com to try out any of the JLR Campus and share my experience. Accordingly, I opted for Bannerghatta Nature camp and spent a night there. This post shares my experience. Unlike other Jungle Lodge facilities that are far from Bengaluru, Banngerghatta Nature Camp is just on the outskirts of garden city but doesn’t compromise on the experience. JLR campus is located about 3kms from Bannerghatta National park zoo and can be reached easily by public transport for under Rs 20 per person from Bengaluru city, if you don’t want to spend a lot on taxis. From the bus stand JLR staff will arrange transportation till the resort campus. If you are arriving by your own vehicle, there is another way by road which reaches JLR through its rear entrance. After returning the rented Audi Q3, I took a bus and reached Bannerghatta National park bus terminal and called the JLR staff, a jeep was sent for me and soon I was driven through the forest to the spacious JLR Bannerghatta nature camp. My tent was ready and after a simple registration process I was guided to my tent for fresh up. The swiss tent was pretty robust- is as large as a premium hotel room, has detachable windows, has 2 layers of wall and roof making it pretty strong against any external elements, had proper wooden door and a large bathroom area. Bathroom is build with brick and mortar, well equipped with geyser and other standard facilities. Tents can accommodate up to 3 people. Other accommodation options in JLR are dormitory (not all JLRs have this), log huts, wooden huts, executive tent etc. While tents come equipped with fans, Log huts and other premium accommodations come with AC. I will try to detail these options in a separate post. But all guests irrespective of type of accommodation will get same experience when it comes to food, outdoor activities etc. 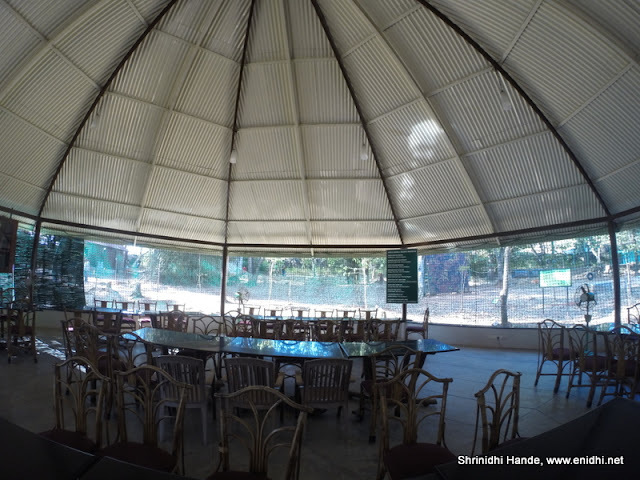 I freshed up and headed to Gol Ghar (translates to Circular house), the dining area in the JLR campus. Gol Ghar is covered with nets to prevent birds entering the dining area. Standard buffet lunch, largely South Indian in nature was on offer. Staff are friendly and a live counter can get you select items like omelettes on demand. Had my lunch, returned to my tent for a quick nap. Next activity was forest safar and zoo visit. Bannerghatta Nature park has very high probability of spotting wildlife (Kabini is another) among all JLRs. The Forest safari involved visiting elephant, tiger, lion, bear enclosures during which we spotted lots of wild animals up close. Safari pictures and details are available in this separate post. After the safari we stopped for few minutes at a viewpoint. (Only JLR guests have access to this- those who take forest safari from Zoo won't be stopping here) After this we were dropped at Butterfly Garden. While entry fee is paid by JLR (It is factored in your stay) camera fee needs to be paid separately (Rs 25). As we went inside, it was little disappointing, as there were too few butterflies that were too small in size. Information about the butterflies was nicely displayed and the small enclosure is well designed, but butterflies were hard to find. In my opinion you can possibly skip visiting butterfly garden (But authorities keep bringing in more butterflies into the garden, so 6 months later things might be better). After the butterfly garden we headed to the Zoo. Lots of construction activities were going on in Bannerghatta at present. Electric vehicles can be rented here for a quicker and convenient tour of the zoo campus. Zoo is large and has good collection of animals, but after having seen Zoos in Berlin, Copenhagen and Australia, Indian zoos feel poorly managed. The Safari+ Butterfly garden visit + Zoo visit lasted from 2.30 PM till 6.30 PM. So it helps to carry some water and other essentials with you while heading out. Also nothing much will be available for purchase inside the campus, so anything you might need, plan and buy during the zoo visit. JLR staff are pretty familiar with all types of cameras and can help click good pics from their seat(that has best view) if required, they are also rich with information and can answer any question you might have. We came back to resort by 6.30, enjoyed hot coffee and freshened up. Every evening at 7 PM, a wildlife documentary will be shown in JLR campuses. They depict the life in forests, struggle for food, hunting practices, effect of summer and rainy season, dangers to wildlife, forest fire and human-animal conflict issues. Every city dweller should spend a few minutes watching these documentary, so that they develop a sense of respect for wildlife. After some time in front of bon fire, the dinner was ready, after which it was time to have a night full of sound sleep. Day 2 began at 7 AM, with a nature walk. Guests were given binoculars to help them take a closer look. I had my 300mm, so didn’t need one. We came up close with Bisons, Deers and a few birds. Refer to this post for more details and pictures. We learnt about the deadly foot and mouth disease and efforts taken to cure it. As we walked by the lake that is believed to have crocodile, one of the guests asked “What time will the crocodiles come out?” – our guide answered with confidence and precision- 11.30 AM! I am sure the crocodile has eaten one of CM Sidharamaiah’s watches! 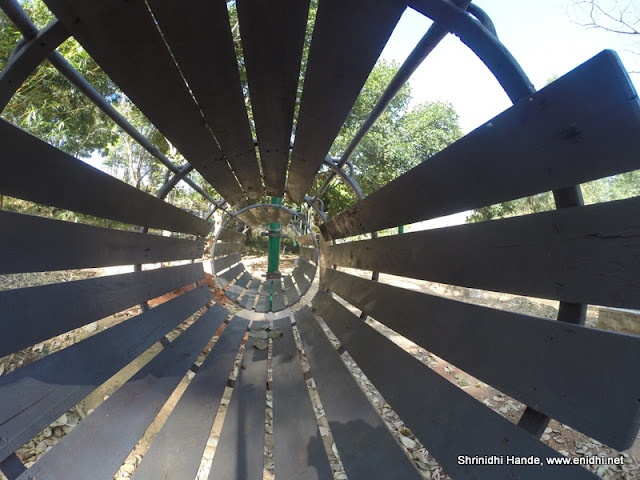 After a generous south Indian breakfast, we had some free time- JLR campus has small play area for kids and few more relaxation options for adults. By 11 AM it was check out time, terminating our memorable 23 hours stay at the Jungle Lodges campus. I took some pics of the dormitory, executive tents and log houses once the guests vacated them. I was dropped back to the bus terminal and my memorable stay thus concluded. JLR doesn’t encourage individual tips- few boxes are kept in select locations where you can drop your tip amount which will be shared among staff members. Depending on the location, outdoor activities will vary. If there is a river nearby, then a coracle ride, angling etc will be part of the itinerary. If there is a hill then probably a light trekking. Thus every location is sure to give a unique experience. Amount paid includes all critical activities- stay, food, safari etc so there won't be need to keep paying more. Jungle Lodges are increasingly getting popular among national and international tourists and usually gets sold out very quick. Every year their rates get are getting revised upwards by 5-15% approx. If you are thinking of checking out one of their campus or having a family outing in the nature, you should not delay your decision. In many places, Jungle Lodges has exclusive access to forests, as it is backed by Forest Department and tourism department and there are no alternative stay options available. Few years ago I had published a post comparing various Jungle Lodges facilities in Karnataka and their pros and cons. Click here to read how different JLR facilities compare with each other. While booking online at JLR’s official website gets you a small discount, agencies like thekarnatakatourism.com can get you much better deal. So I strongly recommend checking with them for planning your Jungle Lodges experience. If you do not want to stay, some JLRs have a day visit package, which lets you enjoy facilities and services of JLR campus from morning to evening, for a fee that costs about Rs 1200-1500 per person, half or what a tent accommodation costs. But day visit option is available only in select JLR campuses. The tents look pretty neat. It is a good day trip for Bangaloreans. You rightly said there...Indian zoos are not well managed..reminds me of a tragedy that happened in Delhi Zoo sometime in 2014. We had been Bannerghatta National park few years back, we guess this camp was not open back then! We had stayed in Jungle Lodges resort, but this camp looks more interesting and cozy! Just blaming the zoos for everything is easy but do people follow rules -they tease every animal ,throw stones at them ,if they are sleeping they throw whatever they find -food ,cigarettes whatever they get hold off and yes they also "accidentally" fall into enclosures and blame zoo authorities and the poor wild animal which has been caged.Do you know how these rubbish when consumed by these wild animals affect their health. @The Wild: Fully with you. We humans are inflicting lots of damage on animals and their habitat. Even in zoo yes people will misbehave like you mentioned. @Archana- it is an enclosure- much larger than cage, but yes, still confined to few hundred square meters instead of open forest. Thank you... Have you stayed in any JLRs so far?